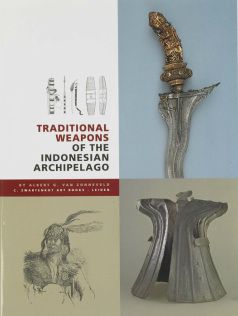 Reference work on Indonesian edged weapons (andar, badek, balato, baluse, barong, bayu, buko, golok, jimpul, kalasan, kampilan, keris/kris, kudi, ladieng, mandau, niabor, palitai, pandat, parang, pedang, sewar, sumpitan, tumbok lada, wedung, etc). In addition, shields, spears, war hats and war dresses are illustrated and described. The unicity of this book is that an edged weapon can be determined by the shape of its blade using a scheme and without knowing its Indonesian name. The illustrated pieces have been drawn from the National Museum of Ethnology at Leiden (the Netherlands) as well as from several private collections. Among them some 65 keris and keris hilts in part collected during the 19th century and now regarded as masterpieces held at the above-mentioned museum.